From the World Heritage Site of Hadrian’s Wall to the lesser known villas and amphitheatres that once dotted the land, Britain has a surprisingly large amount of Roman ruins that can still be visited today. Although most of the remains are in England, Wales boasts some of the best preserved sites in the country including the five metre high city walls of Venta Silurum and the spectacular remains of Isca Augusta at Caerleon. Although Scotland also lays claim to a abundance of Roman remains, most of these date from the 1st and 2nd centuries and therefore are not as well preserved as their southern neighbours. To get the most out of our interactive map, please select the ‘Satellite’ option below which in our opinion, allows you to more fully appreciate the sites from above. If you notice a site that we’ve missed, please let us know by filling in the “Have we missed something?” form at the bottom of the page. Once the capital of a Romanised tribe of native Britons, visitors today can still see two beautiful Roman mosaics as well as the remains of the town wall and a museum exploring the history of the town. Dating back to the reign of the Emperor Hadrian, this fort was originally built for two purposes; to protect the Ravenglass to Brougham Roman Road as well as acting as a supply base for Hadrian's Wall to the north. Excavated in the late 19th century, Aesica is the ninth fort on Hadrian's Wall. A Roman bathhouse has also been discovered a short distance south of the fort. This enormous earthwork follows the route of Hadrian's Wall from coast to coast, although its purpose has long been argued. It is now thought that Agricola's Ditch (also known as the Vallum) was built as a boundary for the militarised zone around Hadrian's Wall, i.e. so that the local civilians would keep their distance! Once a maritime supply fort for Hadrian's Wall, today Arbeias barracks and gatehouse have been reconstructed and a museum set up to showcase the history of the site. This unexcavated fort could have once housed up to 1000 troops and until the late 18th century, the stone remains could still be seen. Unfortunately the remains of the fort now lie underground although it is still possible to make out the ramparts. Although the mighty Hadrian's Wall stood as the main defensive feature protecting the northern extent of the Roman Empire in Britain, the coastline close to the Scottish border was still exposed to attack. To plug this gap in their defences, the Romans built a series of milefortlets extending down the Cumbrian coast from Hadrian's Wall, linked by a road rather than a wall. Although many of these defences have now been lost, one of the major forts was located at Beckfort. Now just a series of crop marks, the fort was manned by the Romans until around AD 407 and was once home to the Cohors II Pannoniorum, a 500-strong infantry unit from the province of Pannonia, corresponding to present-day western Hungary and parts of eastern Austria, Slovenia, Croatia, and Serbia. Excavated in 1879, evidence of a civilian settlement, or vicus, was also uncovered. Boasting some of the most complete Roman mosaics in the country, Bignor Roman Villa was discovered in 1811 by a local farmer and has been a popular visitor attraction ever since. The villa dates from around 200AD and was demolished or burnt down around 200 years later. This well preserved fort on Hadrian's Wall was built around 110AD and included barracks, granaries, officers mess and even an exercise building (i.e. a Roman gym). There is also a visitor centre which includes displays and artifacts from the fort, and rumour has it that the tea rooms here are also very good! This large Roman fort was established around AD80 as a defensive measure for the newly built Dere Street. There is still a wonderfully preserved stretch of Roman road at the site, as well as remains of a bath house with underfloor heating. This large Roman villa and courtyard was built in the 1st century AD and despite frequent Anglo-Saxon raids and the occasional fire, remained in use until the 4th century AD. Today all of the 12 ground floor rooms can still be seen, including a fabulous mosaic in the main entertaining room. Bremenium was once an extremely well defended Dere Street fort complete with artillery defences. Remains of catapult emplacements have been found, once used by the Romans to fire boulders at marauders coming down Dere Street from the north. This cavalry fort actually sits in the middle of the modern day village of Ribchester. Although only small parts of the fort have been excavated, there have been some fantastic finds uncovered over the centuries including the Ribchester Hoard. This third century Saxon Shore Fort was built to defend the south coast of Britain against invaders from Denmark and Germany. Today the walls still stand up to an impressive 4 and half metres high. Although nowhere near as well preserved as its neighbour Burgh Castle just a few miles away, this Saxon Shore Fort was partially excavated in the 1950s although much of the fort now lies under modern housing. The excavated part of the site is now managed by English Heritage and is open to the public free of charge. Once the capital of the Iceni tribe (of Boudica fame), Venta Icenorum soon became one of the most important Roman settlements in East Anglia. Today the most visible part of the remains is the town wall which still stands at around 20 feet high. Much of the rest of the site still lies unexcavated. This relatively well preserved town is unique in that it did not become completely abandoned after the end of the Roman rule in Britain. Instead, the Anglo-Saxons decided to make nearby Winchester their home, leaving the remarkably intact remains that can still be seen today, including the city walls and the amphitheatre. Camulodunum (or modern day Colchester) was the home of the first permanent Roman fortress to be built in Britain in AD 43. Over the next 400 years the fort grew into one of the largest Roman cities in the country and even, for a short time, the capital of Britain. It is also the site of Britain's only known Roman Chariot Racing Track. If visiting, be sure to check out Balkerne Gate right next to the Hole in the Wall pub: this is the best preserved Roman gateway in Britain. As featured in Time Team Special 19 2005 "Britain's Lost Roman Circus". Once the most northern fort on Hadrian's Wall, today the only visible remains of Carrawburgh fort (a.k.a. Brocolitia) are earthworks and a small Temple of Mithras. The site of a small Roman town, fort, amphitheatre and mines. Only earthworks remain. Although the structure of this villa dates from around AD120, it went through a dramatic extension and improvement in around AD310. Today the site is managed by the National Trust and is one of the largest villas of its type in the UK. Be sure to look out for the amazing mosaics, some of which were unearthed as recently as 2011. Currently the largest amphitheatre ever found in Britain, only half of the site has actually been excavated. It is thought that the arena was rebuilt more than once, and that the remains of the current amphitheatre date from around 280AD. At its peak, the amphitheatre could have seated up to 8,000 people. This Roman bridge would have spanned the North Tyne River for some 60 metres, carrying the weight of both a military road and Hadrian's Wall upon its arches. Unfortunately very little remains of the western side of the support abutments, but on the eastern side there is still considerable stonework to be seen. A surprisingly large amount of the original Roman core remains in Chichester's city walls, although most of the visible stonework is the result of 18th century restoration. Cilurnum was the supporting fort to Chesters Bridge, and today is considered the best preserved Roman fort along Hadrian's Wall. There is also a museum at the site which houses a collection of Roman finds from the nearby area. The remains of one of the largest Roman amphitheatres ever found in Britain although unfortunately no stonework can be seen, only earthworks. At its height the amphitheatre could have seated over 8,000 people. Little remains of this Dere Street fort except for a small excavation of the officers quarters which is located in the centre of Chester Le Street. Starting life as a Hadrian's Wall fort, Cordbridge developed into a large civilian centre sometime in the late 2nd century AD. Amongst the remains here are some of the best surviving examples of military granaries in Britain. There is also a museum on the site which displays the Corbridge Hoard. The only publicly accessible Roman villa in London, Crofton is situated next door to Orpington Station and features some quite substantial remains including tessellated floors and a hypocaust. There is also a museum on site. First discovered in the 1940s, Cunetio was a Roman town between the 2nd and 5th century AD. Today all of the remains lay underground with only minor earthworks being visible. Dere Street was once the main supply route and only major road between York, Hadrian's Wall and onwards to the Antonine Wall in Scotland. Today the route is still used by many major roads including the A1, although the occasional Roman milestone still remains. 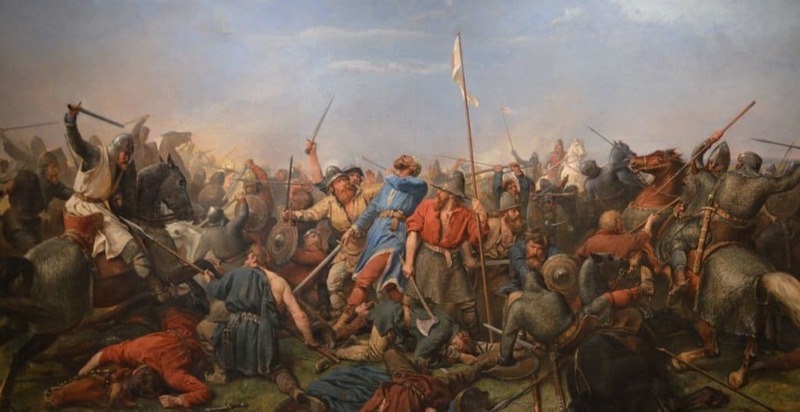 There are also sections of the original Dere Street which have not been built on, such as at West Woodburn in Northumberland and Gilston in Scotland. A spur road leading from Dere Street to Berwick-upon-Tweet, the route of which can still be made out in several places. Dubris, now known as Dover, was one of the most important sites in Roman Britain. Originally a base for the Roman fleet of the Classic Britannica (a branch of the navy designed to protect the English Channel), the town quickly grew into a major trading centre due to both its proximity to Gaul and its positioning at the start of Watling Street. Today there are considerable remains of both a Roman villa and the west wall of a fort at the Roman Painted House (which also includes a museum). The remains of a Roman lighthouse can also be seen within the grounds of Dover Castle. Once the capital of a Celtic tribe called the Cantiaci, Canterbury was captured by the Romans in the 1st century AD and renamed Durovernum Cantiacorum (meaning 'stronghold of the Cantiaci'). By the 3rd century AD the city had been rebuilt and grown into an area of around 130 acres, enclosed by a massive city wall with seven gates and a substantial earth bank. Unfortunately not much remains of Roman Canterbury, however sections of the original city wall around the North Gate area can still be seen. There is also a Roman gate still visible, albeit blocked up and incorporated into the medieval city walls. If visiting, be sure to stop in at the Roman Museum which, amongst a host of finds from the city, includes an in situ mosaic dating from the late 2nd century AD. Founded in AD71, Eboracum started out as a Roman fort but soon grew into a urban centre with residents from throughout the Roman Empire. Remains that can be seen today include the military headquarters which is open to the public and located underneath modern day York Minster, as well as a Roman bath (located under the Roman Bath pub in St Sampson's Square), a temple and a portion of city wall in the Museum Gardens known as the Multangular Tower. This peculiar lozenge shaped fort was thought to have protected Roman lead mine interests in the area, as well as acting as a support fort for nearby Hadrian's Wall. The site is currently unexcavated but is popular with mole hill archaeologists, i.e. rummaging through mole hills looking for Roman remains! A major Roman road that ran from London to York via Lincoln. Most of the route has now been incorporated into the A1, but there are still parts (namely just south of Lincoln) where the original Roman road is a public footpath. Over 70% of the original Exeter city wall still exists, and although much of it dates from Anglo-Saxon and medieval times, there are still large portions of the original Roman stonework. Larger than Buckingham Palace and easily the largest Roman residence north of the Alps, Fishbourne Roman Palace was built in the 1st century AD although it is not known who for. Today there are some fantastic mosaics on display, as well as a museum and a reconstructed Roman garden. The Fosse Way was one of the most important Roman roads in Britain, linking Exeter, Bath, Cirencester, Leicester and ending in Lincoln. Many sections of the road are now public footpaths. This former fort and adjoining settlement was built during Emperor Hadrian's reign and was in use until the late 4th century AD. Excavations have revealed official buildings including the commanding officers house, as well as numerous civilian buildings, a fort and a small natural harbour. Excavated in the 1960s and again in 2000, Gatesbridge Villa once housed the second largest swimming baths ever found in Britain. Now that the excavations have been completed the villa has been recovered with grassland. Built in the first century AD, it is thought that Great Witcombe Villa once housed a fabulous water garden. Today the remains consist of a latrine, bath house and hypocaust, as well as the outline of the walls of the villa and a mosaic floor. Only ditches and a small amount of stonework at the north-eastern corner of this Dere Street fort can still be seen. Hadrian's Wall is the most prominent and important monument left by the Romans in Britain, spanning the entire width of the country. 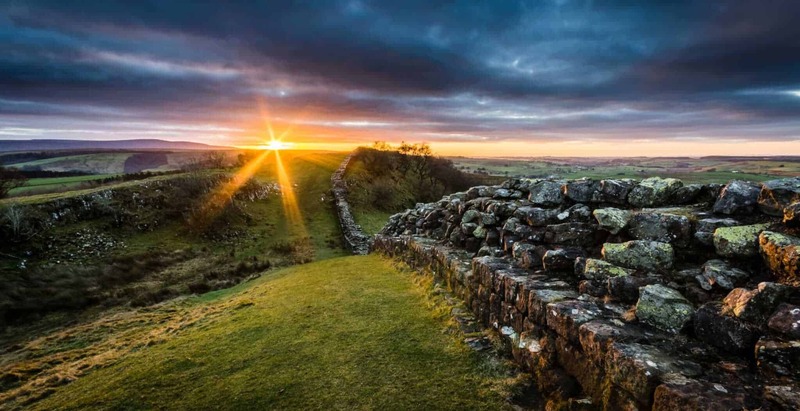 Read our full article about Hadrian's Wall here. Located at the juncture of Hadrian's Wall and Dere Street lies Halton Chesters Fort (also known as Hunnum), although only earthworks can still be seen. Originally an Iron Age hill fort, the Romans captured the site from the Britons in AD45. Built between AD120 and AD138 during the reign of Emperor Hadrian, Hardknott Fort (Mediobogdum) appears to have been occupied initially only briefly before being re-occupied probably in the late 2nd century. It housed a cohort of 500 men, the fourth Cohort of Dalmatians, infantry soldiers from Croatia, Bosnia-Herzegovina and Montenegro. Read our full article on Hardknott Roman Fort here. Built to house around 800 soldiers, Housesteads is one of a series of Hadrian's Wall forts and is relatively well preserved. In fact, rumour has it that Housesteads boasts the best preserved Roman latrine in all of Britain! Standing up to 8 metres high, this strikingly well preserved wall was once part of a Roman bath house. The reason it has survived for almost 2000 years is that the wall was once used in the structure of a nearby church. Letocetum was once a significant Roman settlement with temples, villas, a basilica, forum and amphitheatre. Although the majority of the remains now lie under the modern village of Wall, a bath house and official stopping place (mansio) can still be seen. The remains of Littlecote Roman Villa is perhaps most famous for its well preserved Orpheus mosaic which dates from the latter half of the 4th century AD. From around 200 AD, the shape of London was defined by one single structure; it’s massive city wall. Lost for centuries, many sections of the wall were uncovered during WW2 bombing and can now be seen from Tower Bridge all of the way to Farringdon. Click here for our full walking guide. Yet another Dere Street fort, Longovicium is situated some 20 miles south of Hadrian's Wall. Although it is not currently open the public, there are plans by local authorities, Durham and Newcastle Universities and English Heritage to allow public access to the site. Built in around 100AD, Lullingstone Villa is a family friendly site boasting fantastic mosaics and wall paintings, as well as the remains of a bath-suite and temple. Built in AD60 to support the Roman army in their campaign against Boudica and the Iceni, Lunt Roman Fort has now been fully excavated and is open to the public. The fantastic wooden gateway was built in the 1970s with the same tools and equipment as would have been used by the Romans. Once a Iron Age fort, Lydney Park was used by the Romans for the mining of iron ore. In the 4th century AD a temple was built on the site, the remains of which can still be seen today. One of sixteen forts along Hadrian's Wall, Carvoran is not the most spectacular or most excavated site in the area, but it is the home to the Roman Army Museum which is well worth a visit. This well preserved Roman barrow is at the junction of Queensway and High Street Green in Hemel Hempstead, and although not currently open to the public it can be seen from the side of the road. An early Roman fort, rebuilt around AD122 as a supply base for the coastal defences of the mighty Hadrian's Wall. The coastline to the south of the wall being vunerable to attack was defended by a series of Roman milefortlets extending down the Cumbrian coast. Maryport represents the southernmost fort of these defences, guarding a crossing of the Solway Firth. An observation tower in the museum grounds reveals the extensive remains of the site. Restricted opening times and entrance charges apply. Although the mighty Hadrian's Wall stood as the main defensive feature protecting the northern extent of the Roman Empire in Britain, the coastline close to the Scottish border was still exposed to attack. To plug this gap in their defences, the Romans built a series of milefortlets extending down the Cumbrian coast from Hadrian's Wall. Although many of these defences have now been lost, including the watchtowers that stood between each milefortlet, Milefortlet 21 is the first to be fully excavated. Free and open access at any reasonable time. Although the mighty Hadrian's Wall stood as the main defensive feature protecting the northern extent of the Roman Empire in Britain, the coastline close to the Scottish border was still exposed to attack. To plug this gap in their defences, the Romans built a series of milefortlets extending down the Cumbrian coast from Hadrian's Wall, linked by a road rather than a wall. Many of these defences have now been lost, and only the earthwork remains of Gabrosentum are visible. Occupied until the early 4th century, St Bridget’s church and graveyard now stand on the north-east corner of the fort. Newport Arch was built in the 3rd century to carry Ermine Street through the city of Lincoln and is still used by traffic today. There is also a small section of Roman city wall to the east of the arch. A purpose built museum designed to show the remains of the city’s Roman bath house, previously hidden under a car park. Excavated in 1975, the public baths served the local Romano-British community between the 2nd and 5th centuries. The museum also includes other collections, charting the social history, archaeology and geology of region. Restricted opening hours and entrance charges apply. This Saxon Shore Fort was built around AD290, and although most of the structure dates from the medieval times there is significant Roman masonry in the outer curtain wall. This Roman villa was discovered by workmen in 1781 when they uncovered a complete mosaic. Unfortunately when the local townspeople of Northampton came along to see the mosaic they decided to break it up and take it away as souvenirs! Recently a museum was set up on the site displaying a host of finds and remains from the villa. The remains of a Roman Bridge which once led into Piercebridge Roman Fort from across the River Tees. Large masonry blocks and one of the bridge abutments can still be seen to this day. Piercebridge is the southernmost of the Dere Street forts, the main road linking York to Hadrian's Wall and on to the Antonine Wall. With the earthworks still clearly visible from the adjacent A6, the fort was built upon the old Roman road that ran northwards to Hadrian’s Wall. Occupied between the first and fourth centuries, it is thought the fort was built by the 2nd Cohort of Gauls, or Cohors II Gallorum, a mounted cavalry unit recruited from the Gallic tribes of northern France. Although excavations around the fort have revealed the existence of a large civil settlement or vicus, we can find no evidence of this from the satellite image... but don’t just take our word for it, take a look for yourself! The best preserved of all of the Roman Saxon Shore Forts, Portchester Fort (also known as Portus Adurni) appears almost as it did the day it was built… at least from a distance! Only four bastions have been lost in the past 1600 years, whilst inside the Roman perimeter walls is a Norman stronghold. With its stone walls still standing at almost 4m high, the ruined bath house stands outside the nearby 2nd century Ravenglass Roman fort. Although now on private land, the earthwork remains of the fort are still visible from the bath house. Originally of turf and timber construction, the fort served as an important naval base guarding the nearby harbour. Free and open access at any reasonable time. This courtyard villa includes fabulous Roman mosaics, a bath house, living quarters, workshops and underfloor heating. There is also a museum of the site which includes artefacts from the villa. The Roman Baths and magnificent Temple were built around the natural hot spring which rises at 46°C and were at the centre of Roman life in Aquae Sulis between the first and fifth centuries. The remains are remarkably complete and include sculpture, coins, jewellery and the bronze head of the goddess Sulis Minerva. Situated on the site where the Romans first invaded Britain in 43AD, Richborough Castle was built in the late 3rd century as a Saxon Shore Fort. The castle is now managed by English Heritage and in places the walls stand at around 20 feet high. Lying at the eastern corner of Hadrian's Wall, Segedunum is the most thoroughly excavated Roman fort in the country. Unfortunately only the foundations of the fort still remain, although there is also a modern reconstruction of the military bath house. Stanegate Roman Road was built in around AD80 to link together two major forts but only became a frontier road after the withdrawal from Scotland in 105AD. The original path of Stanegate, including milestones, can still be seen in locations such as Corbridge and Vindolanda. During the post-war reconstruction of London, an archaeological treasure was found amongst all of the rubble and debris; the Roman Temple of Mithras. Click here to read our full article about this site. Situated around three miles from the town of Rugby, Tripontium was originally a frontier fort built in AD50 to support the Roman invasion to the north. The following centuries saw the site grow in size and become one of the most important towns in the area. Unfortunately the site is not open to the public after excavations were completed in 2006. Verulamium was settled in the first 10 years of the Roman occupation of Britain and was granted city-like status in AD50. In AD61 Boudica sacked the city and burnt it to the ground but it was soon rebuilt after the Iceni uprising had been quelled. Remains that are now visible include city walls and a theatre, although the majority of the old Roman city remains unexcavated. Built to protect the Stanegate (a road which ran just south of Hadrian's Wall), Vindolanda is perhaps best known as the site where the Vindolanda Tablets (the oldest handwritten documents in Britain) were found. Once the fourth largest Roman city in England, Viroconium Cornoviorum (now called Wroxeter) contains the largest free-standing Roman ruin in England as well as other extensive remains. There is also a museum on the site which is managed by English Heritage. Running from Dover to Wroxeter via London, the path of the original Watling Street is today covered by the A2 and A5 roads although there are certain portions which are either accessible either as footpaths or bridleways. Preserved in a steel vault under the A1(M) motorway, these fantastic remains of a large villas baths are remarkably intact. There is also a small museum which includes an exhibition about the site as well as finds which were uncovered during excavation. Also known as Old Carlisle, the fort was constructed towards the end of the first century AD. A strategically important outpost, it formed part of a military frontier against the hostile Picts to the north. Home to a 500 strong cavalry regiment, a small civilian settlement or vicus formed just to the south of the fort. Although much of the stonework was recycled in the 18th century to rebuild Wigton, much of the earthen ramparts are well preserved. Free and open access at any reasonable time. Surrounding Winchester Cathedral's grounds is the old medieval city wall, with one visible section of the original Roman wall still intact. The building of the Antonine Wall started in AD 142 and is thought to have taken six years to complete. Running from east to west and stretching some 37 miles from modern Boness on the Firth of Forth to Old Kilpatrick on the River Clyde, the wall marked the extent of the Roman military advance northwards from the existing frontier of Hadrian's Wall. Built in AD 82 as a command headquarters for the Roman invasion of Scotland, Inchtuthil is fairly unique in that it was never built over and therefore was in remarkably good condition when excavated in the 1950s and 60s. Built as a base for the Romans advance into Scotland, Trimontium would have at one time housed around 2000 soldiers and civilians. Only faint earthworks can now be seen, along with a monument which marks the site of the fort. Situated on the highest point of the Antonine Wall, the remains of Bar Hill include a bath house, granary, barracks and fort headquarters. There are also the remains of an Iron Age fort on the site. Almost all of the Roman fort at Bearsden is hidden under modern housing, although the fort's bath house has been excavated and is now on public display. These remains date back to around 143AD and were discovered by builders in 1973. Built in AD 80 by Governor Gnaeus Julius Agricola, the impressive remains of Castlecary Antonine Wall fort are well worth a visit and are easily accessed from the M80. Not much remains of this Antonine Wall fort except for a single wall ditch and two beacon platforms. Pennymuir was once home to three temporary camps for Roman legions heading between Hadrian's Wall and the Antonine Wall. Remains that can be seen today include Dere Street as well the camp's ramparts and entrances. Although Rough Castle was the second smallest fort on the Antonine Wall, it is also one the best preserved with relatively well defined ramparts still visible today. Also visible is a set of Lilas pits which would have had stakes at the bottom, as well as the line of the military road that would have linked all of the Antonine Wall forts together. Although not much of this 1st century auxiliary fort still remains, it is possible to see some scarped slopes to the north and west of St Marys Church. To the north of the church the path of a Roman road can also be seen. Finally, be sure to look out for Roman masonry which has been reused in the walls of the church. Built in the 4th century AD to protect Anglesey against Irish invaders, Caer Gybi is remarkably well preserved with some parts of the original wall standing to over 4 metres in height (notably the north-western corner). The other walls have Roman foundations although were rebuilt some time later. Built in AD75 to support the Roman conquest of Wales, Isca Augusta once housed up to 5,000 soldiers and was not abandoned until the late 4th century / early 5th century AD. There is a phenomenal amount of remains still visible including an amphitheatre, baths and barracks. Although the majority of the Cardiff Roman Fort is a Victorian reconstruction, the original Roman walls can still be seen incorporated into certain portions of the Cardiff Castle. These visible remains are that of a Saxon Shore Short which was built around 300AD, although it is thought that the site housed at least two earlier forts. Cold Knap was once a Roman port, and the remains of a 3rd century building can still be seen along the shore. Dolaucothi is though to have been the only Roman gold mine in Britannia, and would have been protected by an accompanying fort (known as Luentinum). In the 18th century a large hoard of Roman gold ornaments was found (now on show in the British Museum). Situated in modern day Carmathen, the visible remains of Moidunum are limited to an amphitheatre thought to have been the furthest west ever built within the Roman empire. Artefacts from Moridunum excavations can be seen at the nearby museum in Abergwili. Situated at the corner of a main road and a modern housing estate lies the remains of the south gate of Nidum Roman Fort. One of the best preserved Roman roads in the whole of Britain, the remains of both cobbles and a ditch are still visible at the Maen Madoc stone in the Brecon Beacons. Built in around 80AD just a few years after completing their conquest of Wales, Segontium was the largest and most important Roman fort in north Wales. The remains of many of the forts buildings are still visible, quite surprising really considering that Edward I plundered most of the stonework for his castle at Caernarfon! Visible earthworks of a Roman amphitheatre (albeit a very small one), bath house, temple, parade ground and even a Roman road can be seen, although most of the remains here are from a much later Norman motte and bailey castle. Unquestionably the best surviving Roman town defence walls in Britain (standing up to 5 metres in places! ), the remains at Venta Silurum also include a house with underfloor heating, basilica, forum and temple. The site is open to the public. Built in AD75 at the crossroads of two Roman roads, Y Gaer would have been occupied by a contingent of 500 Spanish-recruited cavalrymen. Visible remains today include the perimeter walls, gatehouses and guard towers. Although we've tried our hardest to list every Roman site in Britain, we're almost positive that a few have slipped through our net... that's where you come in! If you've noticed a site that we've missed, please let us know via our contact form. If you include your name we'll be sure to credit you on the website. From Julius Caesar’s first landing on the shoreline of England in 55BC to the famous ‘Look to their own defences’ letter of AD410, the Romans played an important part in British history for over 400 years. The Romans were famous for introducing a uniform currency throughout their empire, meaning that coins that were accepted at Hadrian’s Wall would also have been accepted in Rome, Carthage and Athens!